Piles of mail, many posts I might not get back to...But I tasted reasonable temperatures and interesting people as well as fun time with daughter Liz and grand daughters Maya and Anna. I seem to always go back to the Sagebrush Inn. (I have stayed in five or six other places in Taos.) Staff is friendly, you can get a two room executive suite, or a cozy adobe room with fireplace and wood provided. It is dog friendly, kid friendly, and has a free eggs and bacon or pancake breakfast. Plus..it has great light and sunset views. Sometimes it appears shabby, because it is always being repaired somewhere. Yeah, pool and hot tubs...but it is more than that, once you stay awhile. Georgia O'Keefe did just that. You can rent her room if you want. Some nights there is a country band playing cowboy two step music in the Cantina. Ancient floors..great art. I think it is the casual approach and tolerance that keeps me coming back. Or maybe it is the good light. Or maybe the cool temperatures. 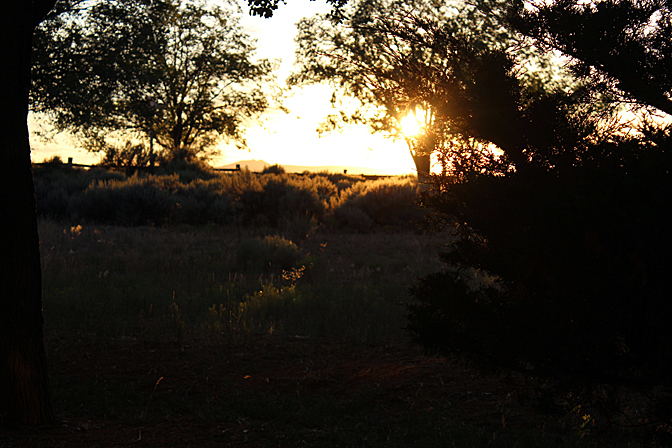 As of August 2nd, the sagebrush lights up at about 7:40. Sunset to follow in various stages til about 8:15. And you meet such fun photographers in the field. Good folks. With mostly phones or smaller cameras, yet, all waiting for THAT shot. If you get lightning, which you easily could...Ah....surprise Bingo. Maybe tomorrow I will see what I got on Sunsets. For tonight....Sagebrush that lights up.